Single Glow kicks off the summer on Memorial Day at The Headliner with an all-day event featuring The BStreetBand and many other live performances. Single Glow & Jersey Music Live are proud to present the Jersey Shore Memorial Day Summer Kick-off Party, on Monday, May 26, 2014 at The Headliner (1401 State Highway 35 South, Neptune, NJ). 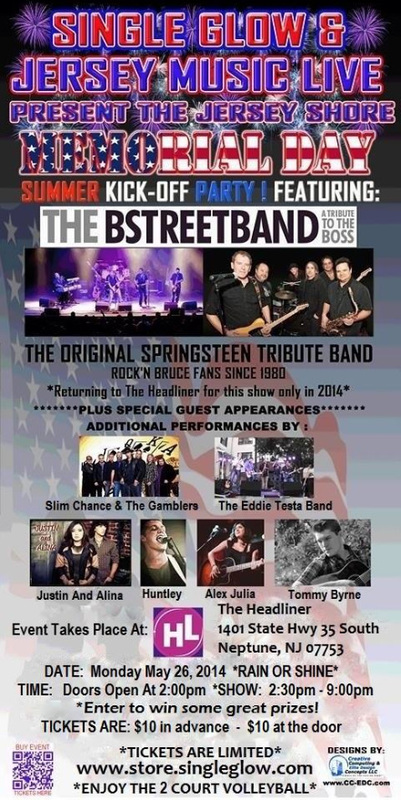 The event will run 2-9pm (rain or shine) and will feature The BSTREETBAND – The Original Springsteen Tribute Band which has been Rock’n Bruce Fans Since 1980, and is returning to The Headliner for this show only in 2014! There will be additional performances by Slim Chance & The Gamblers, The Eddie Testa Band, Alex Julia, Justin and Alina, Huntley, Tommy Byrne and more. You can also get more updates from the Facebook event page.